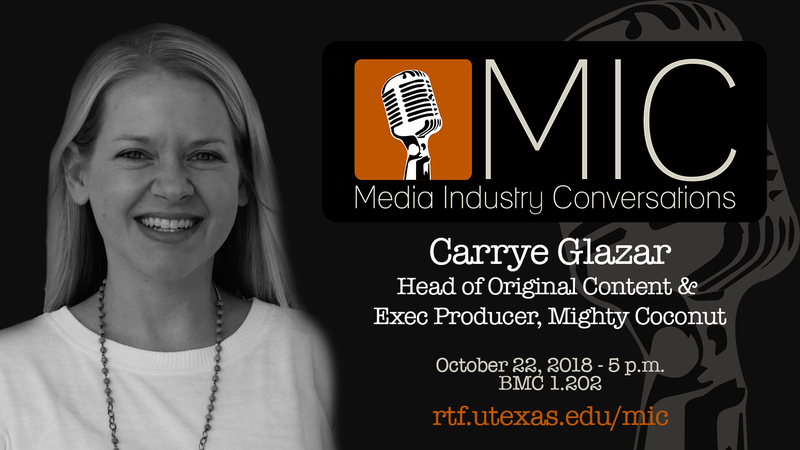 When: Monday, October 22, 2018 - 5-6:15 p.m.
Carrye Glazar (RTF BS ‘01) discussed her career trajectory, her roles and responsibilities as an Executive Producer and the Head of Original Content at Austin-based Mighty Coconut, and her views on the current state of animation in film, TV, and digital media. As a native Texan who recently relocated back to Austin, Carrye has worked for over a decade in content development and production at various companies. After graduating from University of Texas at Austin with her Radio-TV-Film degree and a minor in Business Foundations, she worked as a production assistant for Lynda Obst on Someone Like You and then with Benderspink in management and production. From there, she worked her way from assistant to Vice President of Development and Production at Everyman Pictures, Jay Roach’s production shingle based in Los Angeles. There she co-managed a film and television slate of 20+ projects for the company. Some projects include: Meet The Little Fockers (Universal), Borat (Fox), Bruno (Universal), The Campaign (Warner Bros), Dinner For Schmucks (Paramount), Charlie Bartlett (MGM), and Hitchhikers Guide to the Galaxy (Disney). On the television side, she co-produced the Emmy Award winning political docu-drama Game Change with HBO. Most recently, she joined Mighty Coconut, an Austin based production and animation company, where she runs the studio’s original content / development division. She served as an executive producer on YouTube Red’s premium animated series, Kings of Atlantis, which debuted in April 2017 and has a slate of projects including an animated series adaptation of the Missy Piggle-Wiggle books series written by Ann M. Martin (Babysitters Club) with Jessica Chastain attached to star, a live action movie adaptation of Randi Rhodes: Ninja Detective with Octavia Spencer producing, and an adult animated feature film with Lucas Martell directing at Rooster Teeth/Full Screen.